It's absolutely gorgeous! Thanks for all the tips. I stalled out on mine months ago. Yours makes me want to pick it back up again! Great work! I'm in the middle of Circle Play so I know these are tough! The background really sets off the blocks well. Wonderful ! love it very much. 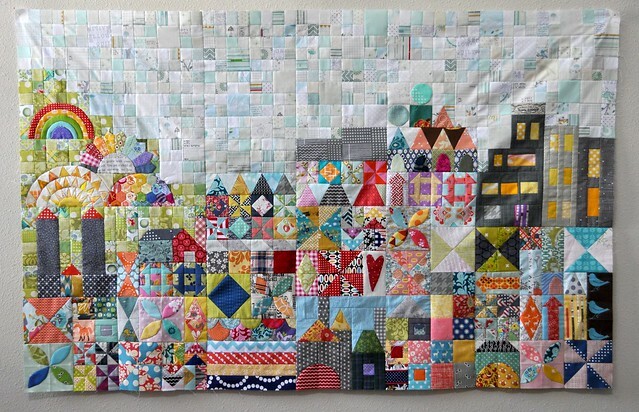 What a great quilt, I think you've done an amazing job of it and can see why it would take so long to get done, Congrats for sticking with it. Wow I love it!! I don't ,or I should say I haven't done a sew a long. I realize the sew a long is finished , but think I might just have to try this one! Oh I love it!! Are you going to hang it once it is finished?